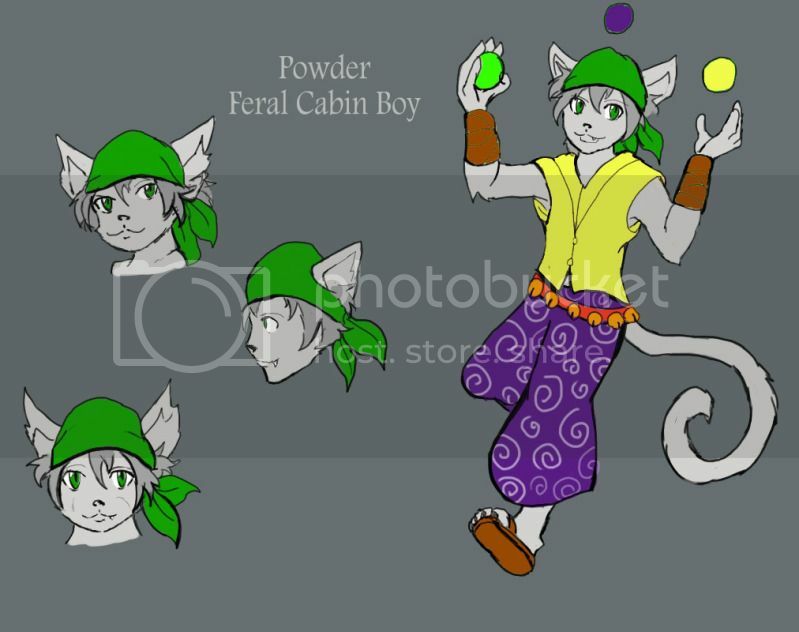 Sinsystems wrote: Hey I'm looking for someone who can make an avatar pic (and any more if you'd like) of my Feral character Noh. He is 23 years old with Yellow eye's and grey hair. he wear's an eyepatch over his left eye (was playing with a sword and poked his eye out). He wears a red trench coat with a black undershirt and black short pants. Keeps a sword at his side at all times (strapped onto his back) and was a bottle of wine around his hip. Oh and he talks like a pirate. Don't forget about his Green Beret, and Shiney Pin! Location: In da crows nest. Yarr!! i am looking for an artist to draw my idea for the TIR'AY MONTHLY -TEI'KALIATH SWIMSUITS EVENT. my idea is thus, my character Powder in purple swim trunks. the interesting thing is he would look like cat that had been dunked in water. he would have messed up wet fur and look upset like he got tricked into the swimsuit contest.